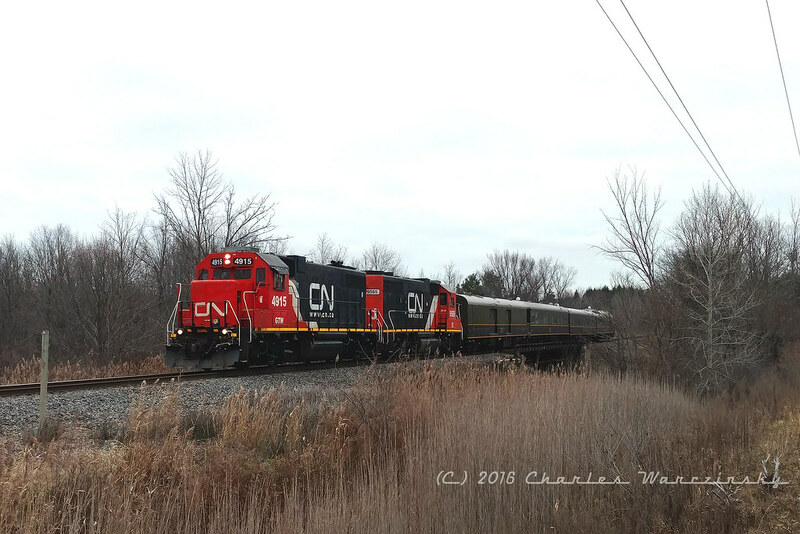 Canadian National is running the annual Santa Train over the Grand Trunk Western in Michigan this weekend. The train traverses the same route at approximately the same time and is parked in the same terminals at the same times as it has for the past several years. And like the past several years, it’s an all passenger movement, pulled by a pair of CN painted locomotives. For a basic rundown of the train’s consist since approximately 2010, see my post from last year about this train. This year’s train was slightly different from last year’s in that the GTW locomotive lead the IC locomotive. The power was also slightly different, utilizing GTW 4915 and IC 9565, and with four cars in tow, there was one fewer car than last year’s train, but one more car than the train ran with just a couple years ago. I wasn’t sure I’d be able to see the train this year, as ongoing work on my train warehouse has been occupying most of my weekends in recent memory. On the plus side, that work is wrapping up, and routine maintenance should overtake the major remodeling projects that have required most of my time lately. But as luck would have it, I got a late start yesterday morning and found myself stumbling out of the house just before the train was scheduled to leave Port Huron for the run to Flat Rock. As I made my way toward the tracks, I dug my scanner out of my camera bag, to see if the train was on time or otherwise. And sure enough, the crew was getting their Track Authority from the dispatcher as I turned the scanner on. A quick rearranging of my planned series of errands enroute to the warehouse, allowed me to arrive at my planned photo location with about 5 minutes to spare, the shortest time I’ve ever had to wait for the train in this particular location. True to tradition, the spot was devoid of other railfans. I’d originally planned to just take pictures of the train, but I do like to take video when I can, if for no other reason, to have an audio version of the passing train. I keep an older camera handy for taking pictures when I do choose video over photos, but for some reason the older camera didn’t want to cooperate yesterday. It wasn’t a big surprise, but it was my primary backup camera for catching the train. Not to be deterred by a malfunctioning camera, I realized the camera on my cell phone was better than the camera on my last cell phone, and just might function as a suitable backup. So…I might need a little better timing using the phone as a camera, but at least the shots I got weren’t blurry. I did want a decent roster shot of the IC 9565, which I managed to screw up using the phone, but…it’s hard to do everything perfectly when you’re not using your equipment regularly. In the end, the cellphone shot of the train came out pretty well, all things considered. The video is what it is- a recording of the passing of a train. It’s not a work of art, but you can hear what I heard and see some of what I saw. In other news, I hope to have additional website updates before the end of the year, although I’ve found editing and uploading content to be increasingly frustrating as time goes on, due to a combination of software issues on my end and various changes in Flickr’s interface. Nonetheless, as the train warehouse remodeling project wraps up, I hope to have more time and energy for my photography and limited videography projects, and the ability to share them here. If I don’t see you over the next couple weeks, have a Merry Christmas and a Happy New Year!